Large government conventions and meetings such as the 2016 Republican Nation Convention in Cleveland, Ohio or the Pope's visit to Philadelphia, Pennsylvania require highly coordinated and large security details. It is important to ensure there are plenty of restrooms for both attendees and security personnel during the event. Superior Portables has the experience needed to work with event organizers and security organizations to devise a portable restroom plan that is right for your event. We are a GSA certified vendor making it easier for government affiliated individuals and organizations to use our restroom and shower trailer rental services. 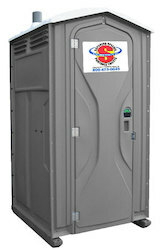 Interested in renting restrooms or shower trailers from us? Contact us today to see how we can provide restroom & shower accommodations for your meeting or convention. 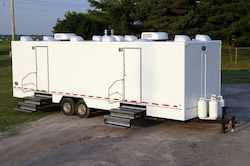 This 18-foot, 8 station mobile restroom trailer is perfect for special events in Ohio, West Virginia, Pennsylvania, Indiana, Michigan and Kentucky. The energy-efficient 8 head shower trailer is designed for the masses. The spotlight was on Cleveland, Ohio when the city hosted the 2016 Republican National Convention from June 18 to June 21.